The University of Louisville might lead the nation in high-profile movie star fans. Oscar winner Jennifer Lawrence cheers for her hometown Cardinals. Louisville has also picked up actor/comedian/pop culture phenom Bill Murray. Murray’s son Luke is an assistant coach for new head coach Chris Mack. When Mack and Luke Murray were at Xavier, Bill Murray was a regular at Musketeer games. But now that Mack and Luke Murray are at Louisville, you can expect to see plenty of Bill Murray. In an interesting coincidence, Murray has a previous connection to the city. Some scenes from his hit film Stripes (1981) were filmed in downtown Louisville, including one right where the Cardinals’ arena, the KFC Yum! Center now stands. Murray has already connected with Louisville. Remember when Zion Williamson was supposed to be the next great thing? Well, he still may be but he’s not even the most highly rated Duke freshman. According to ESPN, the Blue Devils have the top three incoming recruits: No.1 R.J. Barrett, No.2 Williamson, and No.3 Cam Reddish. Barrett has drawn favorable comparisons to DeMar DeRozan and Dwyane Wade. Williamson, listed at 6-7 285 pounds, has some concerned about his heft. Reddish isn’t as well known as the other two but looks to be an incredibly gifted offensive player and a defensive presence. In the first two games of the season, the trio combined to score a staggering 158. The total destruction of Kentucky is the most eye-opening outcome of the early season. Welcome to what could be the college basketball game of the regular season. It’s a matchup of the two preseason favorites, according to the Associated Press Poll and the coaches poll. No. 2 Kansas looks deep and will be keyed by Memphis transfer Dedric Lawson. The Jayhawks also have returnees center Udoka Azubuike and forward LaGerald Vick. Kentucky has its usual armada of freshmen recruits with forward Keldon Johnson and E.J. Montgomery leading the way. But the guy who could make the biggest difference for John Calipari is Stanford graduate transfer Reid Travis. Few players will enter this season with more hype. Bol has the potential to be the sport’s most recognizable face. At 7-foot-3 with a 7-8 wing span, Bol could be the next evolution of the basketball athlete. By comparison, Giannis Antetokounmpo has a 7-3 wingspan and is four inches shorter than Bol. Bol is a big man with terrifying perimeter skills. He looks smooth, agile and can shoot. And he could get bigger. His father Manute Bol was 7-7. He, however, was offensively challenged except for the occasional gimmicky 3-point try. 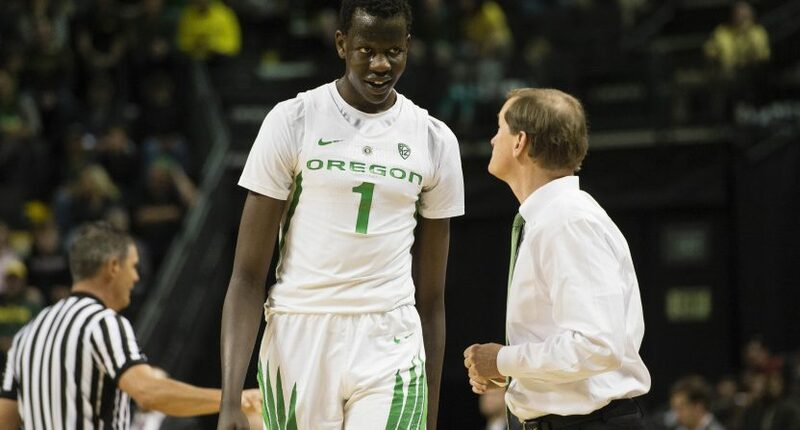 Bol Bol is far better overall player with and with his height, no one is going to stop him from getting off his shot. Through the first two games, Bol is averaging 17.5 points, 12 rebounds, and 3.5 blocks. The Great Hardaway Experiment tips off. He has no previous college basketball coaching experience. His main qualification for the job is that he’s a local legend and one of Memphis’s favorite sons. The school pushed out Tubby Smith just so Hardaway could take over. College sports is mainly about talent acquisition. The hope is that Hardaway can convince players in the talent-rich city of Memphis to play for him. He has an interesting staff that includes former NBA coach of the year Sam Mitchell and ex NBA player Mike Miller. Can this work? Or is this another desperate grab at nostalgia like Chris Mullin at St. John’s or Clyde Drexler at Houston? Do you like upper classmen? Do you like big-time players from small schools? We have a player for you. Senior forward Mike Daum is a scoring machine. He was fifth in the nation last year in points per game (23.9) and was one of three players nationally last season to average more than 20 points and 10 rebounds (10.3) per game. The two-time Summit League Player of the Year is expected to lead the Jackrabbits back to the NCAA tournament. He’s not alone. With four returning starters, South Dakota State could be one of the best mid-majors in the country. The Jackrabbits have a key showcase game at No. 6 Nevada next month. If you’re tired of the negative news in college basketball, here’s something to make you smile: Andrew Jones returned from chemotherapy after being diagnosed with leukemia in December. Jones played nine minutes in the season-opening 71-59 victory over Eastern Illinois. He’s also returning from a broken toe in practice last month. He received a well-deserved standing ovation from the crowd. Last year, as a sophomore Jones averaged 13.5 points and shot 46.3 percent. The former McDonald’s All-American could be a major on-the-court boost and spiritual lift when he returns. Now that Bob Ley is on sabbatical, Jay Bilas might be the most credible person at ESPN. On a network with way too many blowhards and say-nothing commentators, Bilas is refreshing. It’s always welcome when you hear somebody break down college basketball the way Bilas does. You learn something when Bilas is the analyst for a game. He’s prepared. He’s insightful. He’s passionate. Plus, you have to love someone who routinely rips the NCAA for its sham amateur model. Bilas is a national treasure. Hunter Seacat, Appalachian State – Sounds like an old school Saturday morning cartoon: “Tune in next week for the adventures of Hunter Seacat.” Is he Aquaman’s nemesis? This 6-9 junior forward shot 56.5 percent last year in limited action. Pauly Paulicap, Manhattan – Seems like a totally made-up name that a teen would give to a truant officer after being caught skipping school. The 6-8 sophomore forward is a shot-blocking threat and was the Metro Atlantic Athletic Conference defensive player of the year. Sammy Friday IV, Siena – The most amazing thing about his name is that he’s the FOURTH! I would like to meet the rest of the living Sammy Fridays. He also has an epic team bio picture. The junior forward from New Jersey had 15 points and 15 rebounds in 24 minutes at Louisville last year. Sheriff Drammeh, Hawaii – Guessing that NOBODY in the history of college basketball has that first name, has played at Hawaii and is from Sweden. The 6-3 guard senior guard was second on the team in scoring (10.7 points per game). Yes, that’s right. How could you not root for the Chicago State Cougars? They finished last season 3-29 for the worst record in the nation. They were on a 24-game losing streak before winning the final game of the regular season 92-86 over UMBC on Senior Night. That’s how close they came to being winless in the Western Athletic Conference. This year, Chicago State is (of course) picked to finish last in the 9-team league. New coach Lance Irvin, who has beaten cancer twice, has one returning starter. And when you’re this bad, everyone wants to play you. As a result, the Cougars will open the season with their first eight games away from home.